Polly Bull has a PhD in the history of reading and gender from the University of London. She currently works in higher education publishing, whilst pursuing freelance writing projects. Polly tweets @pollyebull. For further articles and projects, please see her new blog, www.pollybull.org. Self-reflective diaries are inevitably emotional. Wording out psychic responses to daily events brings a diarist up close to his or her feelings. Ruminations on personal experience can also enhance and clarify previously murky persuasions. Thoughts committed to paper are somehow more solid, more grounded. What were perhaps fleeting, transient notions also gain a new permanence. So what is the relationship between the solidity of the material diary and the solidity of thoughts? What is the significance of the diary as an object, pages bound together? As a book-like ‘thing’ that embodies usually-private self-expression, how does its physical nature encapsulate the reflective mind? 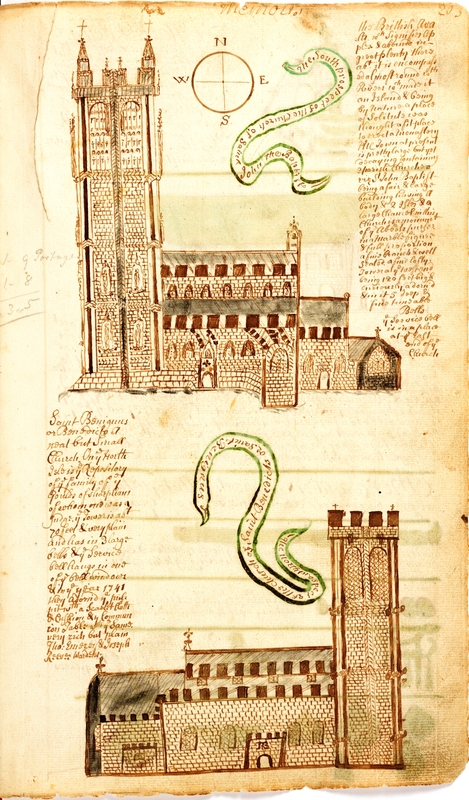 Historically, the growth of diary-writing in the past was stimulated by trends in self-reflection, often religious, and the rise of publishing. Pious diaries in early modern England contained daily devotional practices as well as commentary on holy trials and blessings. Writers also recorded thoughts on spiritual reading. With the growth of printing, books were more visible and accessible to an increasingly literate society. The bookish eighteenth century was a place in which diary-writers might consider themselves ‘authors’ of their own ‘books’. One such author was John Cannon (1684-1743). He was an excise official from Somerset, but is most famous now for his ‘Chronicles’, his unpublished memoirs. He started his book as an adult (aged 41) looking back on his childhood and youth. Eventually he began making daily entries. The diary’s length is estimated conservatively at 600,000 words. Cannon wrote his diary as a ‘story’ of his life, which he intended for a wide audience. He wrote several revisions, which he burnt, finally settling on the ‘authorised’ version copied into a folio volume bought for that purpose in 1740. His diary was never published in his lifetime. In 2010, a two-volume edition was released, edited by John Money. A true and impartial account of his private and publick [sic] transactions with an account of his family ancestors marriages with choice dissertations, epigrams, epitaphs, recipes in physick [sic] and surgery. Occurrences & brief discriptions [sic] of famous men & sayings with his topography of some cities, towns and places in which he was conversant. Very diverting and useful as also ornamental. Inevitably, Cannon’s purpose for the diary made the book an embodiment of self-identity and emotion. He referred to his love of reading in his youth, and went on to show how this reading shaped his life-story. Cannon called himself an ‘author’. His account was often grandiose, as he aligned himself with the ‘holy penmen’ of the Bible. His memoir shows us his belief in the value of autobiography for a wide audience. This sense of authorship is therefore very different from a ‘stream of consciousness’ style of writing we might associate with authors such as Virginia Woolf. On the one hand we have a carefully crafted progression from scene to scene, in which the writer plays God, and on the other, we have the transient, constantly unstable mind in which thoughts and feelings seem to come and go arbitrarily. Whilst diaries can embody both these styles, the objective reality of pen and paper leans towards story-telling and a clinging, concretisation of thoughts and feelings. A diary’s material nature is significant because it embodies a formalisation of moods as well as a potential for re-visiting. As a book, a diary operates like a story, starting from page one and carrying on to the end. Without the transmission from mind to object, the nitty-gritty analysis of emotions might be less defined and more insubstantial. But could we consider instead that it is purely the transmission to language that is the defining point? Might this be the most important step towards cementing thoughts and feelings? Talk therapy leads to self-knowledge. Nevertheless, even if talking substantiates the self-narrative, speech in the eighteenth century did not provide a record, other than the vagaries of memory. Histories of memory and histories of emotion must intertwine accordingly. The materiality of the act of writing matters because it is through pen and paper that a record is left. But it is not just the presence of a historical source that makes the object important. 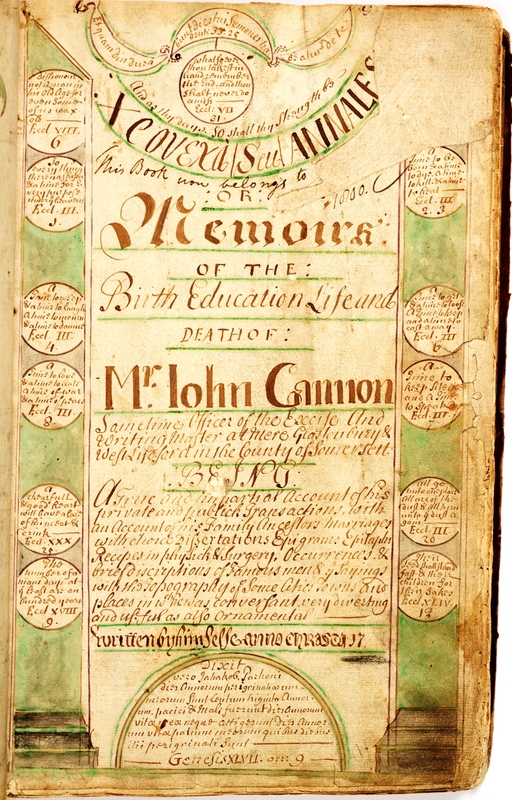 As exemplified by John Cannon, the diary as an emotional object from the eighteenth century was significant because it was a story of the self in an age of books. J. Money, ed., The chronicles of John Cannon, excise officer and writing master, part 1, 1684-1733 (Oxford, 2010). J. Money, ed., The chronicles of John Cannon, excise officer and writing master, part 2, 1734-1743 (Oxford, 2010). Images reproduced with permission from the Somerset Archaeological and Natural History Society. 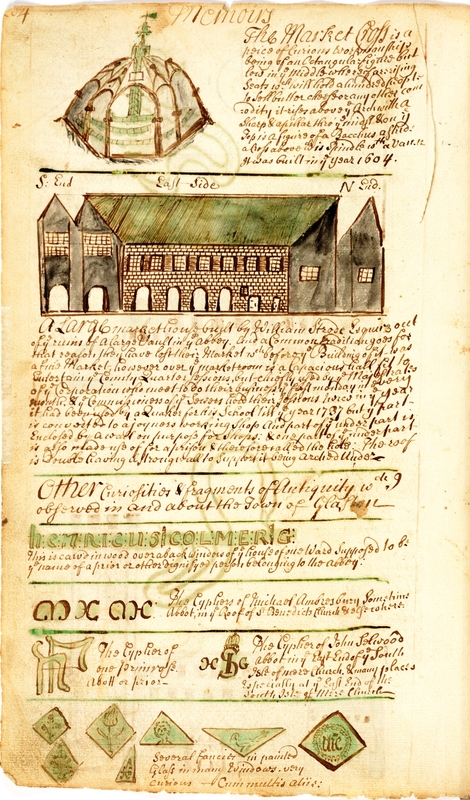 The document is held at the Somerset Heritage Centre. Reference DD\SAS/C1193/4.